Situated at the confluence of the Zambezi and Chobe Rivers, Ichingo Lodge offers the discerning fisherman superb facilities boats and guides to ensure that you catch the fish of your dreams! Prices are quoted per person sharing The package excludes visas where required, non resident surcharge, drinks, river usage fee of $10 pp, additional meals and items not mentioned in the package. Watch the Ichingo video now! Ichingo Chobe River Lodge lies on Impalila Island within the Chobe River known as the Caprivi strip – a small slither of land that belongs to Namibia. Close to where the four countries of Zimbabwe, Zambia, Botswana and Namibia meet, Impalila Island an easy one hours transfer from Victoria Falls or Livingstone making access easy. Due to its unique island location, guests have boat access to over 100 kilometers of prime fishing waters on the Chobe and Zambezi Rivers. Ichingo is owner managed and you can expect extremely high levels of service, food and guiding for the duration of your stay at the lodge. 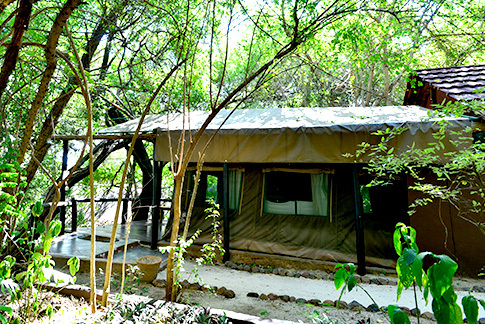 8 comfortably decorated Meru style tents which have en suite bathrooms and private balconies. Each tent has its own assigned tender boat and guide for the duration of the guests stay. This allows for complete freedom to explore the waterways at whatever pace suits you. The main area of the lodge houses the dining area and relaxation areas, as well as a swimming pool. The eastern Caprivi is home to large floodplains with their diverse habitats and variety of fishable waters suitable for beginner or skilled angler alike. 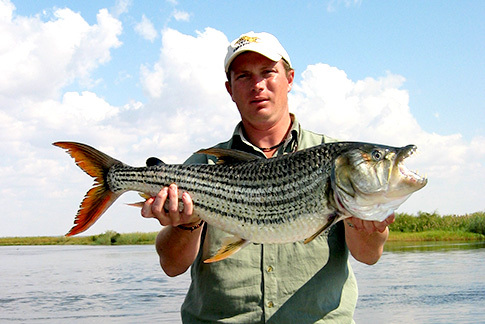 The most sort after prized of these waters is the Tiger fish renown for their ferocious knock and hard fight, can reach up to 20 lbs but there are a number of bream species plus African Pike, catfish and Zambezi Yellowfish which are valued catches. Ichingo is known for quality guiding and the number of well maintained boats which include two jet boats that allow the lodge access to the rapids even in low water. Guests have unrestricted access over 100 kms of fishing waters including the winding Kasai Channel and the streams, islands and backwaters of the Chobe and Mambova rapids. Ichingo offers excellent all year fishing: The annual flood around January and February saturates the floodplains up river allowing the river to replenishing its fish stocks with fingerlings which are flushed into the main channels when the waters start to recede once more. Tigerfish take full advantage of all this extra food, and this can result in incredible Tiger frenzies during the winter months. In addition to fishing Ichingo offers guests the opportunity to enjoy sunset cruises, game watching by boat, cultural excursions and supreme bird watching. The lodge can arrange game drives within Chobe National Park or day visits to Victoria Falls for guests at an extra cost.